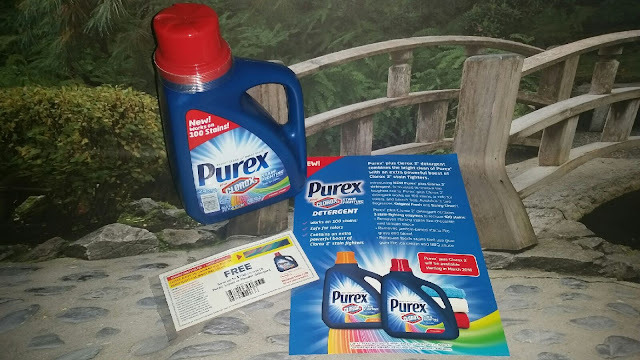 The Purex® brand provided me with a sample of Purex® plus Clorox 2® detergent in exchange for a product review. However all the opinions expressed here are my own. Laundry is a never ending household chore... No matter how many times I check or how careful I am, sometimes clothes go into the wash without being treated for stains. As a result, having a laundry detergent that I can count on is super important. Especially because I want my family's clothes to be clean, stain free, and last as long as possible! As a Social Insider, I am often given the inside scoop on great new products and promotions! In addition, I'm able to test and review products before they even become available in stores! As an added bonus, I get to share the excitement with my readers by offering a giveaway for free product coupons. This makes it a win-win situation for all of us. Don't you agree? My latest kit contained the NEW Purex plus Clorox 2 laundry detergent. The New Purex plus Clorox 2 detergent is formulated to remove the toughest stains. It works on 100 stains, is safe for colors, bleach free, and is available in 2 great scents: Original Fresh & Sunny Linen. My teenage son is a wrestler and my pre-teen daughter plays basketball, loves to climb trees, and ride bikes. As a family, we spend a lot of time outdoors - and you know how dirty that can get. The toughest stain I've had to tackle recently was from a bloody nose... no problem! Normal Use: Follow washing machine instructions for adding detergent. For Tough Stains: Pre-treat by applying some Purex Plus Clorox 2 detergent directly to stains and rub into fabric. Allow formula to sit on stains for 5 minutes. For added stain fighting power, use ¾ cap of detergent in wash.
Disclaimer: The Being Frugal and Making it Work family received a complimentary bottle of Purex Plus Clorox 2 Detergent for the purpose of writing a review and hosting a giveaway. Regardless, I only recommend products or services I would use personally and/or believe will be a good fit for my readers. The views and opinions expressed on this blog are based purely by our own experiences. No monetary compensation was received. Results may vary. I don't think they make a product that we have not tried, unless you count a specific scent. We use the Crystals and dryer sheets, in addition to the liquid detergent. I would also love to try their Classic Purex Sensitive Skin Fabric Softener in the almond milk & aloe scent. I have a 7 month old baby so I would like to try the Purex Baby Laundry Detergent. Purex makes great products. I would like to try the Purex Dryer Sheets. I would also like to try the Purex Crystals Limited Edition Oh So Chic! I use Purex detergents all the time. Another product I would like to try is the Purex Crystals Aromatherapy. Thank you for the review and giveaway! I would like to try Purex ExtendFresh Fabric Softener. I did not know that Purex made this. Over the years, I think I've tried most, if not all, that Purex has to offer. 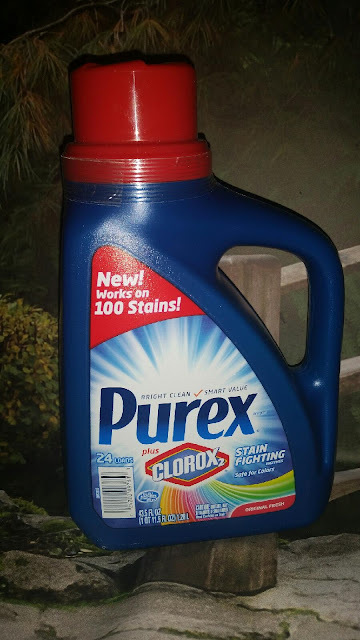 I'm really excited to try this new Purex with Clorox 2. My favorite Purex product is Crystals for baby. I use them all the time, even though my baby is 25, lol. I would like to try the Free and Clear detergent. I prefer unscented laundry care product or have very little scent to them. I most want to try the Purex ExtendFresh Fabric Softener. I love when my laundry comes out of the dryer smelling wonderful and fresh. I would love to try the Purex Crystals Aromatherapy or the Purex Baby Laundry Detergent. I would love to try the Purex ExtendFresh Fabric Softener in our wash so hopefully it will keep everything smelling fresh. I would like to try the limited edition Oh So Chic Purex Crystals. I am going to have to look for it in store before it's gone. I would like to try Purex ExtendFresh Fabric Softener or Purex Baby Laundry Detergent. I would like to try the Purex Crystals Aromatherapy in the Tahitian Breeze scent. It would make the laundry smell really good. I would like to try the Purex Baby Laundry Detergent. I would also like to try out the Purex Crystals. I love all the amazing scents. I would like to try the Purex Classic Dry Laundry Detergent most of all! I have always been very happy with Purex brand products! There are a couple that I would love to try. The Purex Crystals and the Purex Baby detergent! I would like to try the Purex Crystals. I have smelled them and they smell really nice and clean scent. I would love to try the Purex Crystals Fragrance Boosters in the Fresh Spring Waters scent. I would love for it to put a fresh scent in my clothes that would last. I would like to try Purex Extend Fresh Fabric Softener! I would love to try the Purex Free and Clear Laundry Detergent for Sensitive Skin for my older son who has allergies.